Since the demise of E.C. Comics, horror comics in the US have always been something in the background; left untouched, unacknowledged, or held tenuously at arms’ length by the publishers. Sure there was Eerie, Creepie, Dracula Lives and a slew of others that emerged in the 1960s and 1970s; along with works such as Deadworld and the like (In fact, horror comics can be found throughout comics consistently since the late 1940s as showed by The Mammoth Book of Best Horror Comics edited by Peter Normanton). Despite this, when I think about horror comics today; Steven Niles seems to be a major modern voice on the horror-comic landscape. There are others and in fact, I think it’s hard to divorce him from his regular collaborator, Ben Templesmith (an Author on My Radar for a later date) and Robert Kirkman (yet another one for a later date; I should probably get cracking on these things!). However, I think Niles as a horror comic writer has helped the genre become more solid, marketable, and at times, more mature or sophisticated by rebuilding classic motifs (freakshows, mad scientists, vampires, and walking dead) with interesting twists and a strong use of modern day realistic settings and character approaches/reactions. It shows that he’s well read in the genre, and can pay tribute to his predecessors. His ability to work with the genre conventions, particularly reoccurring characters (vampires, other undead, mad-scientists, demon gods, etc) and make them real on their own while also providing also sorts of nods and winks to readers familiar with the characters. His graphic novel, Wake the Dead includes a college-age scientist named Victor, determined to reanimate a corpse with his friends' help...even if it means his friends become a central part of his work. My first encounter with Steve Niles' work as Remains; which remains by far, my favorite of his writings. The story is the classic Zombie-apocalypse, we're all waiting to come true some day. But Niles seeing the emerging trend within modern zombie films, pits not just humans against humans but zombies against zombies. The story contains the slow-shambling mindless zombie, made famous with George A. Romero's films as well as the fast-paced, high octane and over-achieving zombie, seen in more contemporary films like 28 Days Later (of which he also does a comic of) and the Dawn of the Dead remake. At the time, I was doing research on zombie films, so of course, it was love at first bite...ahem, sight. His most famous series that people are most likely familiar with is 30 Days of Night, a story about a group a vampires taking over a town in Barrow, Alaska since it is emerged in darkness for 30 days. The original mini-series has spawned (ironically) numerous sequel mini-series since its release and of course, a movie. The concept is unique and certainly, Niles tells a compelling story, but that’s not what made it a success. For readers of the series, the movie felt shallow and lacking by and large because it wasn’t just story (Niles) but presentation (Templesmith) that made it such a dark, compelling, and horrifying experience. Templesmith’s art made the book. He moves back and forth among highly original materials into clearly intertextual pieces and pieces existing in specific continuities. For instance, Aleister Arcane explores a horror TV show host who is put out to retirement but enacts a vicious revenge on the town reminiscent of the Pied Piper but also invoking the nostalgia of monster-movie marathons on television of the middle to late 20th century. By contrast, he also worked on several series that blended noir and horror such as Criminal Macabre and Dead, She Said. He’s also worked on series related to 28 Days Later, Night of the Living Dead, and Lovecraft’s Cthulhu mythology. Niles has had minimum exposure in the major publishers DC & Marvel. He has written regularly for a few series in DC (including Simon Dark), but nothing major. His work has increasingly been published Image Comics and IDW Publishing (the latter being a major icon of horror-publishing within comics). I don’t tend to think this is a “failing” as some would presume but it make senses given his desire to get real deep into the dark realms of the human psyche. It’s not exactly where Marvel and DC really like to explore as directly as people like Niles do. They do horror; but not often to the degree that Niles takes it. In one of my classes we recently watched a documentary depicting the rise and fall of horror comics as a medium. Just to branch off of this topic I want to elaborate on how horror comics were eventually banned by the comics code of authority. Creator William Gaines came out with horror comics for the E.C. comics branch. They were wildly popular amongst adults and children alike. They were quickly becoming the most demanded comic genre of their time. Their stories were meant to scare the pants off of the avid readers. Some of their stories had such ghouls as vampire, werewolves, zombies and mummies. They were known for their violence and gore but also for their horror wit. This kept the comics scary but provided some reassurance that it was only a comic book and what they were talking about was not actually going to happen. Many horror comic imitators made their own branches of the genre creating more horrific stories with more gore and gross depictions of people being murdered. As these stories got increasingly worse and demented, parents started to ban comic books from their homes. Some even went so far to hold comic book burning sessions to get their point across. After the episode of parents in outrage an organization was formed called the Comic Code of Authority. Horror comics could still be published but they had to be run through the CCA before they were put on shelves. If you did not want to have the CCA look at your work, you could still sell your comics but many newspaper vendors did not sell them for you. The CCA banned the words Terror, Horror, or Weird from the titles of comic books. There are still Horror comic around today with the CCA symbol on the front cover. All in all the influence of the horror comics boom will be written in textbooks and discussed amongst comic scholars for year to come. As someone who had never picked up a comic book until this course, I was eerily surprised how much I enjoyed them. The campy text and coded (though not always done subtly) themes of the stories arouse a sense of nostalgia when reading these windows into history now. Like in any established genre of literature, there are those figures who are paramount in the execution of the art form. Among these figures in comic books, Steve Niles is one of them. Hearing his name does not incite the same butterflies in my stomach as it might to other comic enthusiasts, but after reading some of his work in the "Mammoth Book of Horror Comics," my amateur palette is aware why he is held in such high regard. With this in mind, comics are just poorly filled out story lines without illustration. Though reading is an activity in which imagination is supposed to be utilized to a high degree, part of the allure of comics, especially horror comics, is the vulgar and grotesque pictures enclosed within. Although often contested as a lower means of literature, well written comics can incite the same provoking thoughts if one takes the time to reflect upon what is written and not get too distracted by the art work. I found the whole story of horror comics to be very very interesting. I had never really of anything about horror comics and the comics code. 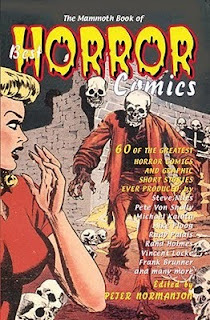 At first we learned about the rise of regular comics, not including horror, than the popular increase in horror comics. People, including kids AND adults, found the the scarier comics were more interesting and intriguing. Because of this, EC Comics became increasingly popular. As well, other companies copied this comic genre. I was so surprised to hear about the comics code and how easily the public is swayed by popular magazines and articles. This made reading about Niles all the more impressive. He had such talent and was an amazing artist. To see all this talent go to waste is awful. Because of the comics code many talented artists had to stop what they were doing and surrender to a higher power. The talented was also considered not necessarily a higher form of art. Comics, especially horror, was never considered to be "high art." This is completely off. The amount of time and genius that went into these comics was something that is unseen in todays comics. These artists wanted to push the limits of civility and complacency. I feel like zombies are a largely growing interest in today’s world. Everywhere I look (not that it’s a bad thing), I see a zombie related… well, anything! There are books, movies, tv shows, bands release concept albums about them, video games, and even (jokingly) survival guides based on zombies and their coming apocalypse (funny enough, the Walking Dead TV show premieres tonight). I feel like Marvel or DC are both missing out on the whole aspect of zombies, even if they do not appreciate or enjoy this artist. I personally think that everything zombie is only going to go up in the next few years. If Marvel or DC want to really sell more comics, not just graphic novels, they should jump on the zombie bandwagon. I feel with this in mind, horror comics are going to be an emerging style of comic in the next few years. “They do horror; but not often to the degree that Niles takes it”, reminds me of the whole Tales from the Crypt history, where the government felt that the artwork was too gruesome for people to be reading, so they had to tone the artwork down. If people do not like the horror in the comic, they do not have to read it. In regards to Steve Nile’s artwork, I feel that he works from the heart. He really knows what will make his readers hearts stop, with his attention to detail and vivid imagination that only he could come up with. He truly knows his horror comics. I have never been a huge comic book reader. While growing up, I was more of a Barbie and My Little Pony type of kid. I tried to get into the whole comic book thing, but failed miserably at seeing the point of Superman and Spiderman comics, where they endlessly fight crime that never really seems to subside. Having to read from the ‘Mammoth Book of Horror Comics’, however, has really sparked my interest in the grotesque world of horror comics, turning me into a sort of scary comic consumer. I now cannot get enough of the graphic illustrations and strange, yet spooky tales that horror comics provide for the reader. Niles can be called a great horror writer easily. Niles used old, worn-out mad scientist and zombie characters, and put a new and refreshing spin on them. ’30 Days of Night’ may be called one of Nile’s best and most famous pieces of work, which has had a great amount of success. He traps the reader into the world of vampires, taking over an Alaskan city. The movie depiction of the story was okay, yes, but it is a defective presentation of Nile’s work. His stories are extremely life-like, and must have good illustrations to make those stories come to life for the audience. Niles is a creative genius, and must be celebrated as so. I as someone who has watched many horror films and read many horror novels (mainly about zombies) I am going to have to say that comics such as the ones that E.C. came out with just wouldn’t do well in today’s society. If a comic like the old school horror comics came out today people would just read it and think it was funny and not get the horror of the story and they would just see camp. The thing with people today is that society has become so insensitive to violence and the old school horror stories that they wouldn’t be scary to us. As mentioned about the comics that are considered horror comics today focus more upon the human and what is going on in their head then what is happening to them. Take for instance The Walking Dead. That comic treats the horror as a way to bring out how people really are and what goes on inside of the human brain. People today just wouldn’t like it and probably stop reading it after like one or two issues. While a comic that is very cerebral and focuses on the human will do much better than the old school horror comic. After watching the video about all the old horror comics from E.C., I found it very well done and quite amazing. Horror comics don’t really interest me all that much, but I always find the art to be amazing and from what it looked like so were the stories. It was a shame that they had to go by the comics code it really messed things up for them. What was great about the old comics was that though it is suppose to be horror, they also have an oddball and cheesy sense of humor, the just desserts. From what I see today with horror comics I often find it quite often with zombies. I can go to a Harrison’s and I would find several comics on zombies alone. Most of those comics just often go for senseless violence, though I could be wrong since I quickly skim through it. I feel that there is no substance to it at all. I think the way Steve Niles’ writing is something other horror writers should often try to aim for. Though I didn’t read all of 30 days of night, I find Simon Dark to be very entertaining and it hurt me when I found out that the series got cancelled. The Walking Dead series though it’s about zombies I do find it very drama oriented to with a very compelling story to go with it. It gives you a sense of how things would work if it were to actually happen. And as popular as zombies are, I feel that they are milking it for all it’s worth. Don’t hop on the bandwagon please! I can appreciate a good zombie game, movie, or comic. The thing is though I feel that if you slap zombie on a something it’s gold and from what it looks like it works too. There are so many games that use the idea of zombies as well as comics. I tend to get sick of it after awhile, but to be honest I end up playing it or reading it because I often find myself enjoying and then hating myself after I had just stressed over the fact that I find myself sick of zombie stuff and it also irritates me the fact that Marvel and DC did go along with it with Marvel creating another universe just for zombies and the black lanterns that is or was going on in the DC universe. I don’t know how I feel about horror comics. I’ll see how things go along the way. The way Steve Niles goes back to the classic horror stories is what really drew me to him in the first place. I look at his long list of varied comics and each one pulls heavily from a traditional horror tale, but with Niles’ own spin. Like when I read any of the Cal McDonald comics I can’t help but make connections to Peter Cushing with a crucifix or Darren McGavin as Kolchak. Steve’s writing sometimes confuses me though. I don’t always understand when he’s going for a particular style of B horror movie, or when he’s really working to create a story his own way. Like when I look at Remains, I completely agree with you, and really think it’s just brilliant, but when I look at Dead She Said it just felt like an entirely different writer. I haven’t read it in awhile but I’m pretty sure I was disappointed with its campy, and silly themes. Especially once I held it up to Remains. I also agree that Ben Templesmith is just phenomenal. He could make the Wonder Twins look badass. All in all the most exciting aspect of Steve Niles is always what territory he’ll venture into next, and how he’ll maintain the nostalgia while mixing in his own modern horror twists. I find it almost amusing to see how much horror comics impacted the general public when their popularity was on the rise in the 1940’s and 1950’s. By this I mean that it is interesting to look at how horror comics quickly became the scapegoat for juvenile delinquency and why the comics code was thought to be so necessary. The images themselves in the comics were extremely gory and frightening but I think they were definitely overlooked as an art form, which is something Adam Schaffer clearly points out. This helps explain why people supported the comics code because they did not look at the comics as art, but as things that were negatively influencing the youth of the time. Also, once the horror comics started to gain popularity among one comic company, the others began to catch on thus increasing the volume of horror comics being put out on the streets. This is still the case today with certain horror topics and mediums. For example, once a horror character/genre hits it big again, film companies and television studios jump on the bandwagon and start producing tons of material based on that one subject. Nowadays there are rating systems to help keep the racy matter out of the view of younger kids, which I think would have been very beneficial 60-70 years ago. This would have helped legitimize horror comics as a true art form and kept them alive past the introduction of the horror comics code. To the anonymous poster earlier who said that horror comics would not be successful if they were published today like they were when they were first printed, I would have to disagree. While it is probably true that people today wouldn’t find horror in horror comics if they were printed, I think it’s somewhat silly to assume that people other than small children found serious horror in them when they were first printed either. When the comics being printed at the time are looked at, ghouls such as the Crypt Keeper and other campy, fun characters are found. It quickly becomes obvious that these comics weren’t printed with the sole intention of scaring people. They were printed to amuse and entertain. Further, if comics are examined today, it seems like a horror comic series would actually do well if it were printed today. Modern series such as The Goon definitely ring of the old horror comics ideals, with a mixture of serious, horror like aspects as well as campy, fun, pun filled portions as well. In fact, a reprint of the older horror comics was recently done and it seems to have done well. While there is no real way of knowing if horror comics would take off again today like they did back when they were first printed, but the idea that they would sit on shelves when series like The Goon are selling well seems far-fetched. Weighing in on whether or not comics should be considered a legitimate art form or not, I'd have to cite Stephen King. His chosen medium is the novel but his goal is the same: to scare and entertain his readers. Stephen King climbs the new york times bestsellers list like spiderman with each and every release, while comic creators such as Niles go unheralded, or even mocked. As far as my appreciation for horror comics, and actually comics in general, they have stemmed entirely from this course. I will admit to viewing comics as a vastly inconsequential medium before this course. But the Mammoth book was some of the most entertaining academic reading of all time. I have actually read Stephen King books: (pet cem, the stand) that were decidedly underwhelming compared to the entertainment value of some horror comics. Niles will never be on the same pedestal as King in the world of horror. But why not within the world comics? But think of music. Sure, Jazz isn't in the top 40 anymore. But that doesn't stop great jazz musicians from being recognized, at least within the genre's confines and fandom. I mean, Herbie Hancock won a grammy for album of the year over a slew of media darlings just a couple years ago. Why can't actual comic publishers catch on? Are comics really that out of the picture? I feel as if comics could be on the rise. A generation of horror comic lovers, or simply comic lovers, has ascended fully to the world of teaching. The more kids who are exposed to comics, through family or school, the more chance they'll have to judge for themselves the artistic validity of the medium.